Restrained Under His Duty is intended for mature audiences. I have not read previous stories in this series. While this story does hint at other people from previous book, I didn't feel that I was missing anything. This is more of a story about protecting those you have come to care about. Ryder is a bodyguard/security for a well-known senator. He has worked for him several years and would do anything for him. When the daughter of the senator, Hadley, is blackmailed into getting her father to retire, Ryder steps in to help solve the situation. Not only is Ryder attracted to Hadley, but it goes both ways. Their mutual attraction simmers almost the entire book. With people attacking the senator, Hadley, Ryder and his friends, Ryder definitely has his hands full. It's almost a race against time and the book is fast-paced and well developed. I liked how despite their attraction, they also were independent, not co-dependent. This is the third book in the series, and I would recommend that you read them in order – there is a thread which runs through them all, and we are getting closer to figuring it all out. This is a wonderful suspenseful book – not just has Hadley been kept in suspense over her feelings for Ryder, but there is murder afoot and a rapidly unravelling situation for Ryder and his team. When things get complicated, they will both be tested on what is exactly the right thing to do next. They both want each other, but that isn't always possible in their world of politics and deception. Hot, tense, and very readable, I can't wait to see what happens next! This is a 5-star SUPER hot read! This is the first book in the series that I’ve read and it’s definitely able to be read as a standalone. Ryder has been security for a senator for years while building up his own security company. When it comes to protecting this senator, he handles the work personally because of Hadley, the senator’s daughter he’s had feelings for forever. The attraction between Hadley and Ryder is mutual; however, Ryder will not let anything happen for fear of it coming between his protecting the family. That doesn’t stop Hadley from trying to get Ryder’s attention though and when someone comes after Hadley to get to the senator, Ryder steps in and will do whatever it takes to protect Hadley… even if that requires making her his! The need to know what happens next kept me up far past my bedtime finishing this one, I just couldn’t put it down. I love the way that the storyline flows, it has humor, suspense, and a TON of steam. I enjoyed every page and can’t wait to see what Stacey Kennedy releases next! For reviews & more info, check out our Bound Beneath His Pain post. 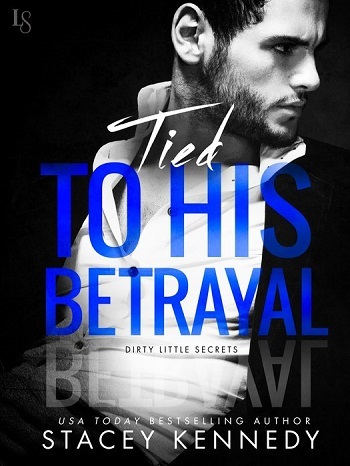 For reviews & more info, check out our Tied to His Betrayal post. Stacey Kennedy is the USA Today bestselling author of the Club Sin series. She writes deeply emotional romances about powerful men and the wild women who tame them. When she’s not plugging away at a new story, she’s either hiking, canoeing, relaxing around a campfire, or obsessing over Suits, The Walking Dead, and Game of Thrones. Stacey lives in southwestern Ontario with her husband (who puts any of the heroes in her books to shame), their two young children, and her other babies: a mini labradoodle named Jax and a chocolate labrador named Murphy. Reviewers on the Wicked Reads Review Team were provided a free copy of Restrained Under His Duty (Dirty Little Secrets #3) by Stacey Kennedy to read and review.